The New Delhi Indian Restaurant, in Penzance, had taken on a new chef, new management and a whole new menu. The new menu had more that 100 food choices many with a description and this was a lot to fit onto an A5 folder menu. So, I set to work and coming up with a colour scheme that suited the restaurant interior and looking at how so many menu items could be laid out in an easy to read fashion. 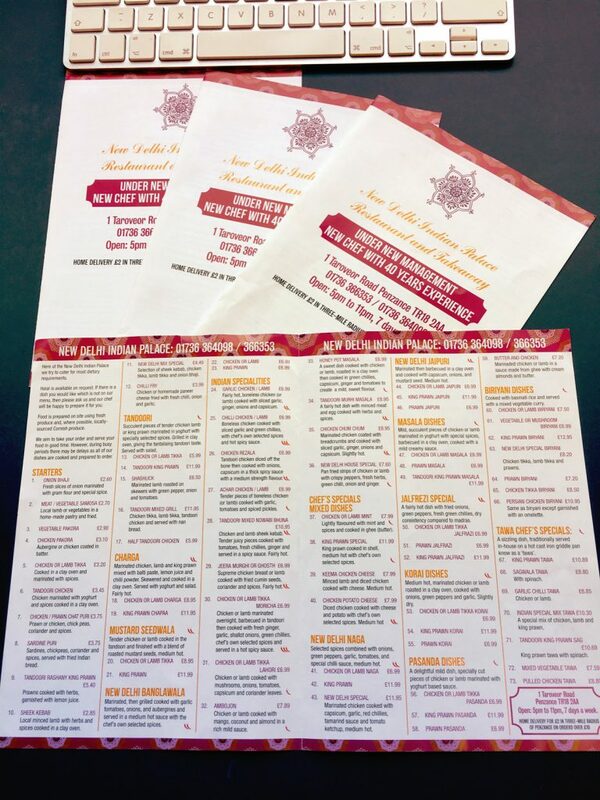 Moshleh, the restaurant owner, was pleased with the result and 5,000 menus were printed for £81 – to go through many of the letterboxes in the local area. Menus are often more complex jobs that usually envisaged to the space and way that the lists are portrayed. The website at newdelhiindianpenzance.co.uk was also updated with the new menu items being sure to keep the numbered items the same for ease of ordering.